CEOs are staying longer in their jobs. It's not just investors who want to be like Warren Buffett. Many CEOs would too. 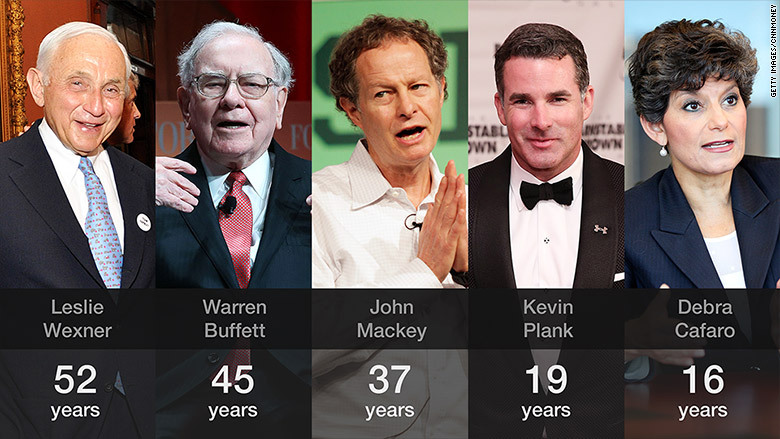 There aren't a lot of executives who can match his longevity, but more are catching up. Top bosses now stay at least six years on the job, according to an analysis by data firm Equilar for CNNMoney. A decade ago, CEOs typically spent five years at the helm of one of America's top 500 publicly traded companies. It might seem like a small increase, but it's a notable shift from the Great Recession and financial crisis when a lot of executives got fired. Those who survived -- or came on board in the new wave -- are keeping their posts. America's surging stock market has been great for CEOs. When company stocks do well, CEOs tend to stick around -- and make more money -- because investors are happy. The U.S. market bottomed out in March 2009. Since then it's been on one of the longest bull market upswings in American history. CEOs are riding the wave. "Going back as far as the 1970s, the relation between better stock market performance for the company and longer CEO tenure is quite strong," says Jason Schloetzer, an associate professor at Georgetown University's McDonough School of Business who studies CEO behavior. There's also been a massive rise in the number of CEOs in their jobs for 10 years or more. In 2005, only 94 CEOs (out of the 500 companies in the S&P 500 stock index) served for at least a decade. Now there are 141 top executives who have been in their jobs that long, according to Equilar. Bosses who founded their companies tend to stick around the longest, says Schloetzer. They have the most invested in making sure the company thrives. America's longest-serving CEO is a good example. Leslie Wexner runs L Brands (LB) (the parent company of Victoria's Secret and Bath & Body Works). He has been in his job since he started the company in Columbus, Ohio in 1963. Warren Buffett is a distant second, having been CEO of Berkshire since 1970. Dan Marcec of Equilar notes that the average age of American CEOs is rising. "They may be retiring soon," he says. There were some marquee retirements this year. Ralph Lauren (RL)turned over the helm of his iconic clothing company after 48 years. And Michael Kowalski stepped down as CEO of Tiffany & Co (TIF). in March after 16 years.